At the Group Stage Draw for the UEFA Champions League™ in Monaco August 29th, adidas and UEFA unveiled the adidas “FINALE 8”, the official match ball of the competition. Visit the World Soccer Shop to buy one today. Like the “EUROPASS”, the ball which was used for UEFA EURO 2008™, the ball’s new surface structure allows players to control and direct it perfectly in all weather conditions. The revolutionary PSC-Texture™, which gives the ball goose bumps, consists of a sophisticated and extremely fine structure on the ball’s outer skin that guarantees optimum grip between ball and boot. CLICK HERE to check out the adidas Finale 8 Match Ball and get one to have for your weekend matches. The new “FINALE 8” balls for the 2008/2009 season will be delivered to the 32 qualified clubs within the next few days. With the start of the new European season, adidas will for the third time supply the Match Balls for all UEFA Champions League™ games. The adidas “FINALE 8” is based on the traditional UEFA Champions League™ star ball design and reflects the colors which can be seen at the different venues: indigo represents the sky, indigo metallic refers to the floodlights and rave green stands for the grass. The “FINALE 8” was presented to the general public and the media with a giant UEFA Champions League™ logo in front of the Grimaldi Forum, where the draw took place. 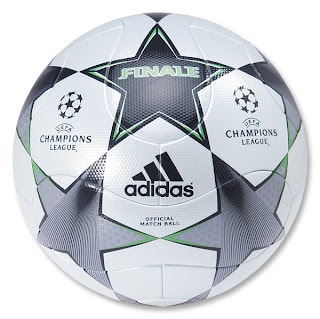 The giant ball, part of the famous UEFA Champions League™ logo, this time consisted of 200 “FINALE 8” match balls. Like the “EUROPASS”, the adidas “FINALE 8” is constructed out of 14 panels using revolutionary Thermal Bonding Technology. This combined with the new PSC-Texture™ surface structure gives the “FINALE 8” its perfect handling characteristics and allows the players exceptional ball control. The unique outer skin improves power transmission, creates greater swerve and increases accuracy on the pitch, in all conceivable weather conditions. And for the goalkeeper too, providing a much better grip between glove and ball, substantially improves his catching of the ball. adidas’ experience in football production is unequalled. adidas first began the production of footballs in 1963 and is the world’s leading manufacturer, always at the cutting edge of technology. Since 1970, adidas has provided the official match ball for all major UEFA and FIFA tournaments, including since 2005 for all UEFA Champions League™ games. The UEFA Champions League™ final has been played with an adidas ball since the 2000/2001 season. Since 2008, adidas is also the supplier of the official ball for the Africa Cup of Nations organized by the Confederation of African Football (CAF). In the future, adidas will continue to use innovative technology to extend its world-leading position in football production and thus strengthen its position as the authentic symbol for high-performance sporting goods for professionals and amateurs alike. adidas also intends to unveil more revolutionary innovations in match ball production for the UEFA, FIFA and CAF competitions. The new match ball has already been in retail since July 1, 2008. Thanks to Soccer365.com for providing this information.